The 88 Project, June 13, 2013: Another famous blogger, Pham Viet Dao, was arrested today (Thursday local time). 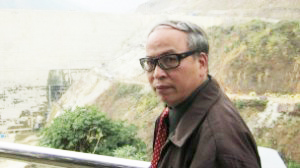 Pham Viet Dao is a writer and translator. He used to work for the Ministry of Culture, and is member of the Vietnam's Writers Association. He has been publicly outspoken about the need for democratization in Vietnam. Prior to his arrest, on 9 June, he gave an interview to the BBC Vietnamese, commenting on the vote of confidence at the National Assembly and the potential outcomes of the ongoing constitutional revision. Please note that Pham Viet Dao's story is very similar to Truong Duy Nhat, the blogger who was arrested a few weeks ago. And they are both charged of "abusing democratic freedoms to infringe upon State's interests..." (article 258 of the Vietnamese criminal code). The investigation agency under the Hanoi Police Department on June 13 issued a warrant for urgent house search and arrest of Pham Viet Dao, a resident in Buoi ward, Tay Ho precinct, Hanoi , for breaking Article 258 of the Criminal Code.